​We welcome each new season with a new variety of classes at Glow, designed to reflect the season, inspire, nurture, and delight. Check out our cozy winter offerings below - all yoga is served on warm heated floors in our intimate studio. Wind down your day with this cozy class designed to work the kinks out of the body and prepare your body and mind for a relaxing evening and a good night’s sleep. Enjoy a cup of Organic Chamomile herbal tea from Three6Tea along with soothing gentle yoga. Warm wooly socks and comfy clothes encouraged. ​Linger on the heated floors as long as you like..
Brighten the darkest days of winter with our colourful Chakras classes. You will feel your best from the inside-out by lining up your Chakras. What is a Chakra and why does it matter? Join us every week and you will learn all about the ancient beliefs of energy centres in the body, as you explore, nourish, and learn more about one Chakra at a time each week. Our Signature Chakra Classes are like no other. Enhanced with colour-light therapy, heated floors and healing crystals all matched to the target Chakra to maximize your experience. Each week's class will be a different style of yoga suited to each chakra. ​Open to all levels and abilities. This is a restorative class to recharge the batteries of your body mind and spirit. Treat yourself to candlelight, heated floors and aromatherapy as you rest and breathe deeply in restorative, relaxing positions, supported by big comfy props and cozy blankets. This healing class, open to all levels, is a stress-buster and a natural way to help you relax and feel re-energized. Enhanced with a warm aromatherapy towel. On Wednesday evenings, your Restorative Bliss is extra blissful, because it is accompanied with live, soothing music. Inspired by those blissful beach vacation yoga classes, this strengthening class is a wonderful option if you are looking to tone up for your next trip. But if you can't travel, we will capture the feeling of a beach yoga class right in the studio. Enjoy the sounds of waves crashing against the shore as you move with your breath through poses from the warm floor evoking a sunny day. Lots of core and a bit of flow in this toning and energizing class. This class is enhanced with beach-inspired essential oil aromatherapy and a short, guided vacation-inspired meditation. No sunscreen required! This fun and playful yoga class is the perfect chance to share your love of yoga with the younger set. Bring your daughters, your granddaughters, your nieces and we will give you an empowering and healthy way to spend time together. Whether your companion is younger or older, they are sure to enjoy this all-abilities fun yoga class with you. This class is all about feeling good. Poses and gentle sequences that focus on nurturing yourself, self-massaging poses, and taking the time to feel good in the class. Enhanced with a peppermint twist self-foot massage, this is a class is all about you-time, definitely one to look forward to and enjoy fully. Improve your yoga skills and your posture. Polish and improve your posture and alignment in different yoga poses and sequences to enhance your skills and advance your yoga knowledge. This class is open to all levels, but get ready to feel "leveled up" as you continue to attend this wonderful foundational class. This progressive workshop-style class explores meditation and Tai Chi every week. Irene Way shares a practice that has inspired her and she aims to share the joy of her practice with other women. ​This winter you will learn how to meditate, and how the gentle movements of Tai Chi can strengthen both the mind and the body. This class is progressive, each week builds on the previous week's learning, so we have just 8 people in the class so that it's easier to keep up. If you are dropping in to check it out, you can catch up with the class by checking out our practice videos here. This class is free to all members. vibration in the mind and body for optimal health and well-being. Feeling stiff? Wake up to a soothing morning class of stretching, strengthening, and moving with greater ease. Gentle movements can go a long way in helping you move with more grace and greater vigor through the day. You will fall in love with this class and how it makes you feel in between! Get ready to face the day with this yummy morning yoga routine. Start mellow on the mat, then wake up the body and mind with a yin and yang style class that will bring you to your feet in beautiful posture with a refreshed and invigorated sense of wellbeing to start your morning with energy and inner peace. This Signature class will have you gently flowing from one joyful movement to the next with your breath, stimulating the lymphatic system and helping you detox and Glow from within, then finishing with gentle yoga for the face. You will emerge from this class with a rosy inner Glow! Now enhanced with essential oils - treat yourself to candlelight and aromatherapy while you melt away your stresses, our heated floors will keep you warm as you channel the ancient practice of using breath to cleanse the organs, the body, and the mind. Excellent for helping with stress, and a natural way to help balance your hormones, which many experts say is key to weight loss and optimal health. Get ready to relax! Once known as the secret of many a toned celebrity, you, too can benefit from Pilates - at Glow! Pilates is a challenging but safe exercise that promotes a balanced body, longer leaner shape, superb posture, strong back and increased mobility and flexibility. Pilates at Glow also incorporates some feel-good yoga style stretching - come and enjoy the benefits of a pilates workout! Available to all members of Glow Fitness for Women, we invite you to practice yoga at your own pace in the studio. 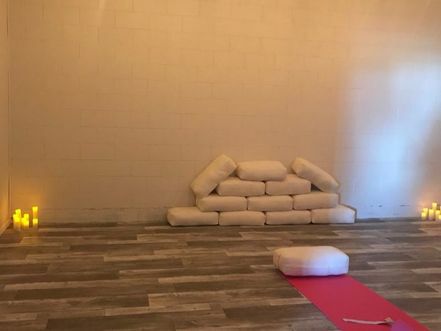 We have a wide range of yoga videos loaded on a TV in the yoga studio for you to use whenever classes are not taking place inside the studio. Self-serve yoga is open to Glow members 24 hours a day, 7 days a week.